There are many different paths on the road to recovery from opioid use disorder. Each individual must find the path that works for them, and sometimes that path involves medication-assisted treatment such as buprenorphine, also known as Bupe or its brand names Suboxone and Subutex. Studies have shown that buprenorphine is highly effective in treating opioid use disorder. According to the results of a Substance Abuse and Mental Health Services Administration (SAMHSA) survey, physicians and patients reported an average of an 80% reduction in illicit opioid use, along with increases in employment and other determinants of health. However, in order to be treated with buprenorphine, individuals seeking recovery must first find a provider who is certified (or waivered) to offer the treatment. With Staten Island being an epicenter of the opioid crisis, the Staten Island Partnership for Community Wellness (SIPCW) and the Staten Island Performing Provider System (SI PPS) have been working diligently to ensure that this evidence-based treatment is available to all individuals in a primary care setting. Our vision is to have buprenorphine treatment integrated in healthcare providers’ offices across the Island, where opioid use disorder can be managed alongside a patient’s other health issues. To achieve this, SIPCW’s Nadeen Makhlouf, PharmD., MPH has been providing clinical coaching and support to existing buprenorphine providers in order to expand their services and to certify a new wave of providers to meet the need of the community. Through SI PPS’s Behavioral Health Infrastructure Project (BHIP), SIPCW coordinated a buprenorphine training at Richmond University Medical Center (RUMC) this past Friday, provided by New York City Department of Health and Mental Hygiene (NYC DOHMH). While previous training sessions only reached a handful of Staten Island-based healthcare professionals, Friday’s training included 34 clinicians from various backgrounds and departments, willing and enthusiastic at the prospect of helping Staten Islanders achieve recovery. Due to the response to this event, SIPCW and NYC DOHMH are exploring additional training opportunities for local providers, including an event at Staten Island University Hospital – Northwell Health. To find a buprenorphine treatment practitioner, visit SAMHSA’s practitioner locator. Does your New Year’s resolution include dropping a few pounds, exercising, dieting and improving your physical health? You are not alone. Each year individuals ring in the New Year with a promise to take better care of their health. While we hear these physical health resolutions frequently, it is rare, however, to hear a New Year’s resolution about improving your mental health. 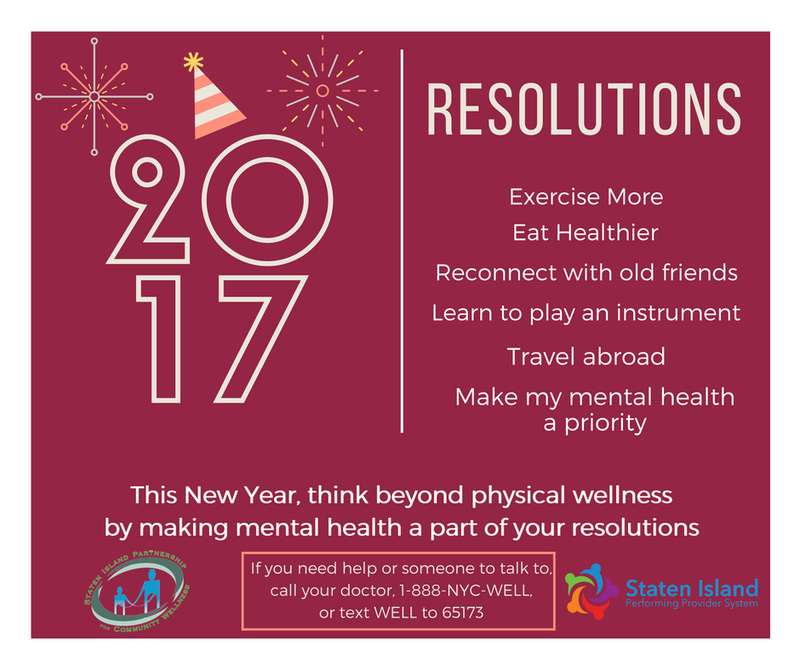 This month, the Staten Island Partnership for Community Wellness (SIPCW) and the Staten Island Paid Provider System (SI PPS) are asking Staten Islanders to think beyond physical wellness by including mental health in their New Year’s resolutions. Follow SIPCW and SI PPS on Facebook for more information.